she covers the puck vs. Concordia on Saturday night. In weekend exhibition women's action from Concordia University in Montreal, the Lady Tommies defeated the Carleton Ravens this afternoon 2 to 1 to earn their first win of the tournament. STU had lost their first two games, 5 to 2 against Ottawa and 3 to 2 versus host Concordia. In today's game, Carleton struck first at 12:08 of the opening period but Erin MacIsaac from Emily Francis responded with 1:16 to go in the frame to tie the score. Rookie Teah Anderson scored her third goal of the tournament at 7:59 of the second period with assists to Kelty Apperson and Caley Stienert. The goal would end up being the game winning marker, as Kristin Wolfe grounded the Ravens stopping 29 of 30 shots. 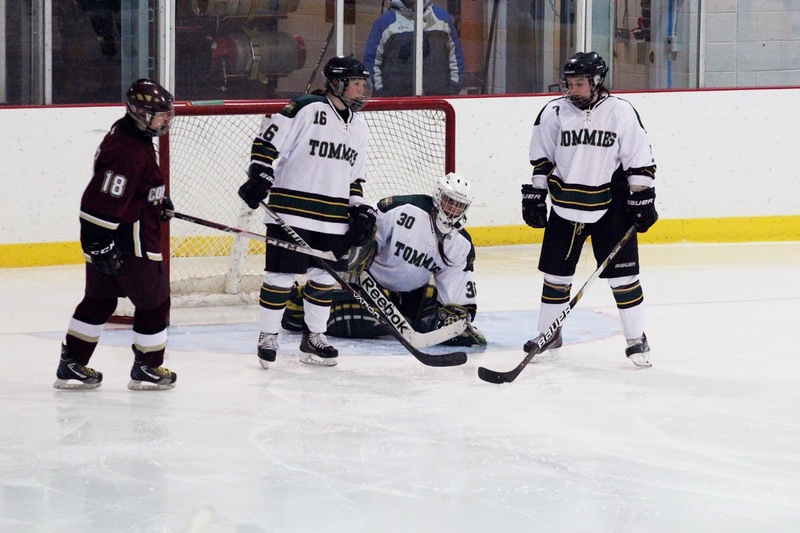 Last night the Tommies spotted the host Concordia Stingers a 3 goal lead before Kelty Apperson and Teah Anderson scored to make things interesting. The Tommies couldn't find the equalizer and lost 3 to 2. STU was out shot 34 to 7. Kristin Wolfe was solid for the Green and Gold. Here are the final results of the Theresa Hume Tournament hosted by Concordia University.